Croatia is a fabulous place for those who dare to explore all the beauties of it. You’ll have to have patience and desire for adventure. Walk, live, feel and see Croatia with us! 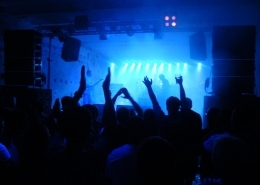 Let us tell you what an awesome time you will have in Dubrovnik. It is a historical city built on a rocky peninsula, surrounded by the sea and centuries-old stone walls. 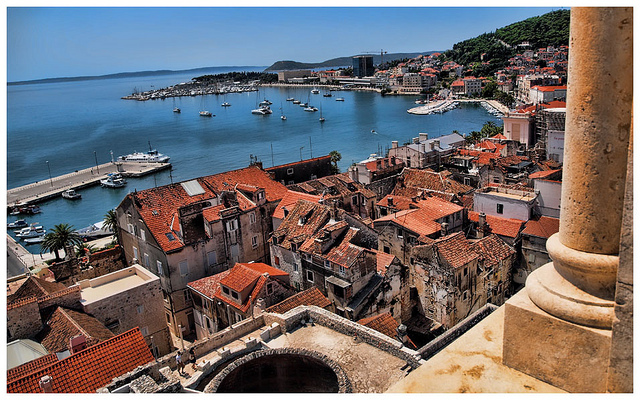 It is visited by many, so it can get very crowded throughout the year; but we will tell you a secret – if you visit Dubrovnik in late April or early May you will make the best of it. That period is the best time of the year because there is enough people to make you feel the atmosphere and the weather is sunny and warm, just as you like it. We recommend you to visit mountain Srđ, that is located 400m above Dubrovnik, where you’ll be able to enjoy the best view over the city. 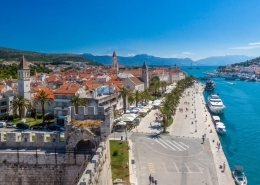 When you enter the town’s walls through Ploče gate, pass Revelin fortress, you should visit the church of St. Sebastian and then continue to the old town’s port. 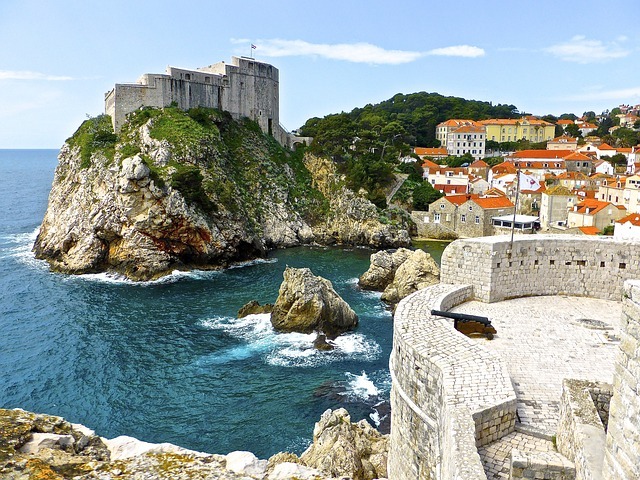 You won’t regret visiting Dubrovnik, ask anybody, especially the Game of Thrones cast. Visit the Rector’s palace and thank us later. Under the Republic of Ragusa, the Rector was situated on the first floor. His mandate lasted for one month and he was obliged to stay there without his family. Today, we know his quarters as the Cultural History Museum that exhibit furniture and costumes from that time, and paintings of Ragusan aristocrats. The ground floor housed the Council’s meeting rooms, an armoury, gunpowder store and the most interesting of them all – the dungeon. The building itself dates back to the 15th century, although some later additions were made in Renaissance and Baroque styles. While you’re there take a look at the other exhibitions in the museum, such as the exhibition about Dubrovnik goldsmiths. The ancient Greeks believed that Brač was accessed by hero Antenor, who brought a shepherd, a farmer and a sailor to the island. 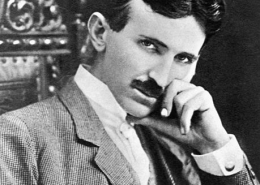 The crafts of these personas shaped the island as we know it today. And you’ll see that you won’t leave without trying freshly caught fish with olive oil and rosemary or having a glass of local homemade white wine served with traditionally prepared lamb. Brač is an island located in central Dalmatia and it is a less than an hour ferry ride away from Split or Makarska. It is famous because of its Zlatni Rat beach, the best-known beach in Croatia. Visit Vidova Gora, which you can easily reach by car, where you’ll experience views that stretch over the Zlatni Rat, the island of Hvar and further south over Pelješac peninsula. Drive along to town of Pucisca, where you can visit local stone masonry school. Stone masonry is extremely important for the people of the island of Brač because it’s an integral part of their identity. Here, the food and wine, taste better, and we believe that the main reason for that feeling comes from the fresh air, sun and tranquillity of this island. If you want to taste the real Mediterranean cuisine, you should stop in the village of Donji Humac, to the tavern Kopačina. Here you can taste Vitalac – a traditional Brač speciality made of lamb roasted on the spit. Pag is a historical island in the northern part of the Dalmatian archipelago and the Adriatic Sea. It is divided into two counties, Lika-Senj County and Zadar County. It has rich historical and cultural heritage. The most famous part of the island of Pag is Novalja and its beach Zrće. Zrće is the party location, where you’ll cross around open-air clubs, music festivals and many other cultural events throughout all summer. But Pag is not just a party island, there is so much more than it can offer. So, walk along Novalja, Lun or Pag town and find out all the beauties of this island of healing herbs, lace, lamb and sheep cheese. For example, the town of Pag was built according to plans by the famous Croatian Renaissance builder, Juraj Dalmatinac. If you visit Pag town you can seize the moment and visit the Pag salt-work – an important part of the island’s history and development. 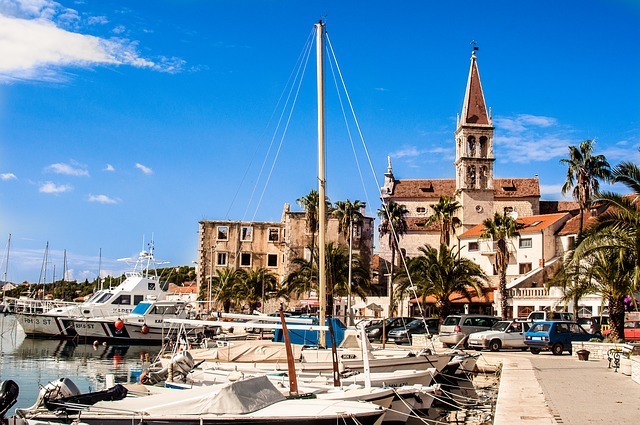 Surrounded by mountains and sea, abundant with fashionable shops, Roman ruins and trendy restaurants – Split definitely has it all. The Riva, the jugular vein of Split, today is a heaven for those who seek an ideal place for having their morning or afternoon coffee, or for an evening out with friends over drinks. We hope you’ll find your perfect match between all the coffee shops and restaurants on this Mediterranean promenade. Peek into the Split museum and galleries – visit the Jakšić Gallery and find out what visual arts are there to discover, visit Milesi Palace, Gallery Kula or Split City Museum. The ruins of Diocletian’s Palace, built between the late 3rd and the early 4th centuries A.D., can be found throughout the city. Walk along the ruins, smell the fresh air and watch the sunrise, we bet you’ll remember it as the chaotic but ultimately addictive city. And maybe we meet again somewhere on Matejuška. It is a town you should visit any time of the year, but if you want to experience it at its best, try to plan your visit from May to October. 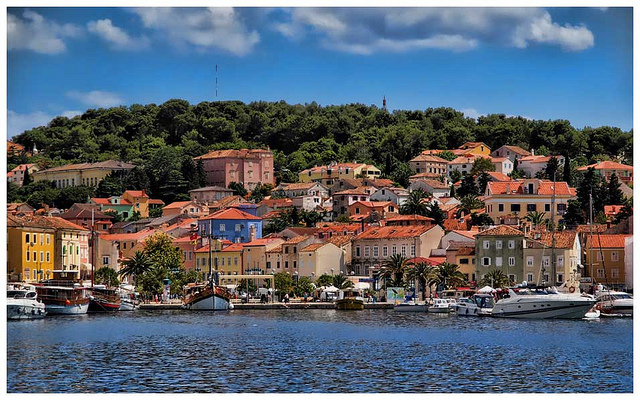 You can call Lošinj an island of sea, sun, herbs, recreation, culture, cuisine and tradition. We recommend it to everyone because this island is a therapeutic place. Lošinj is ideal any time of the year and you will surely love it. 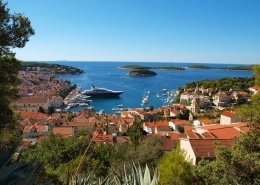 The main resort is the town of Mali Lošinj, the charming town full of hustle and bustle during the summer season. 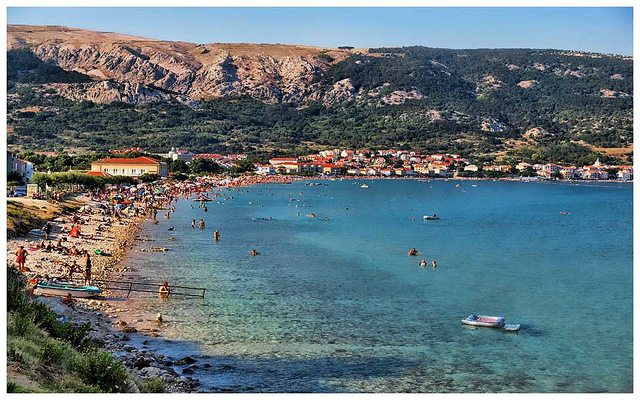 The tourist area is centred around the Čikat bay, which is well known for its beach and its good windsurfing options. The town of Veli Lošinj is quieter and there is easy access to it from Mali Lošinj. The most impressive thing about Lošinj is that in its waters the antic bronze statue was found. It is a statue of Greek athlete, called Apoksiomen, in his natural size that is approximately 2000 years old. Century year old pine forests, forest park Čikat, was planted at the end of the 19th century by Abroz Haračić, a professor of the famous Lošinj nautical school. You should visit the Lošinj Aromatic Garden where you’ll find a cosy little shop with aromatic herbs and local products. 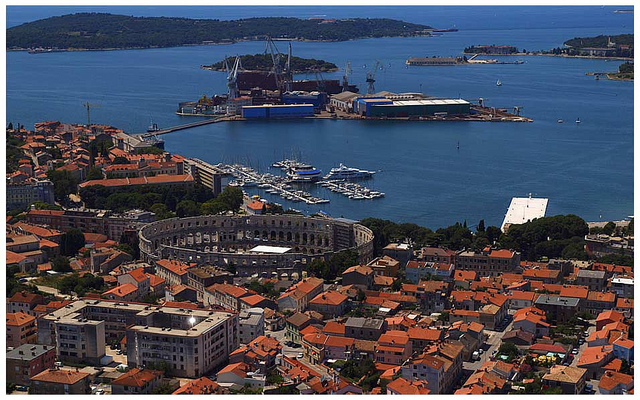 Everybody knows that Pula is a historical city, but a few really know this city. 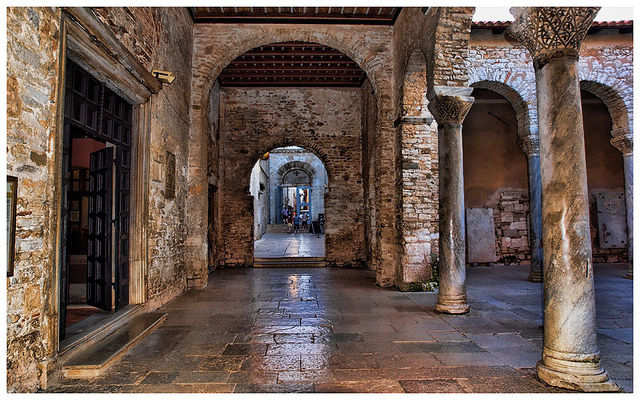 This city is an administrative centre of the whole Istria since the Roman times. Located beneath seven hills and on the seashore, it managed to keep a friendly, small town spirit regardless of the great number of manifestations and visitors throughout the whole year. Raise a glass of delicious Istrian wine to James Joyce, visit amphitheatre, go on a wild night out at Outlook or Dimensions festival, and don’t forget to go for a few-day-trip outside Pula. Go to Premantura or the nearby cape Kamenjak, see the mummified bodies of saints in the small town of Vodnjan or visit the Roman Empire remains in Galižana. Visit the waterfalls of Kotli, which are only a few minutes drive outside Pula. For an arty experience visit Culture centre Rojc or the underground system of tunnels also known as the Zerostrasse (built during the WWI), drink coffee in an art-filled café called Cvajner and check out the exhibits of the upcoming local artists in its funky interior. The island of Krk is the most northern island in the Adriatic Sea, situated in the Kvarner Bay, east of the Istrian peninsula. Krk is a diverse island that offers a variety of attractions and experiences – a thousand years old towns, small rural villages, well-equipped beaches, blue flag beaches (15 of them), swimming bays, bars and clubs, quiet restaurants with perfect delicacies. Locals traditional way of life is connected to the sea (fishing, navigation, ship building), agriculture and livestock farming (especially sheep breeding) that remained on the island until today regardless of the new way of life that came with modern times. The traditional folk instrument, called sopile, is an ancient wind instrument which is an integral part of all island festivities to this day. Island’s rich culture is presented at the Festival of Krk folklore each year so make sure to visit it. Take a tour from the Biserujka cave located in the north-east part of the island to the picturesque islet Košljun and the city of Krk with its two thousand years old city walls, Frankopan castle from 13th century and old City Hall from 16th century. After all, here you’ll find the Church of St. Lucy in Jurandvor, where the Baška tablet was found. The tablet is written in the Glagolitic alphabet created by the stylization of Greek cursive. Rovinj is the main attraction of Istria so it can get overrun with tourists in summer, but you can still feel the spirit of the last true Mediterranean fish harbour. Rovinj is truly one of a kind Croatian postcard. You’ll probably run into fishers that boast about their catch at the docks early in the morning, followed by squawking gulls. There are two harbours: the northern open harbour and the small, protected harbour to the south. In both of them, you’ll find interesting locals that will openly talk with you about the weather or the situation in the country. Out of the 14 islands of the Rovinj archipelago, the most popular islands are Sveta Katarina and Crveni Otok (the Red Island – also known as Sveti Andrija). 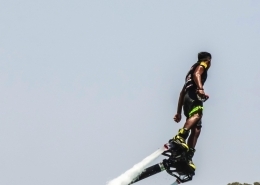 They are accessible by ferries that leave from the dock at the Maršal Tito square. On Sveta Katarina island you can find the prehistoric fort that is the first inhabited place in the Rovinj region. When you’re already here, it is a good idea to visit nearby locations of Istria. 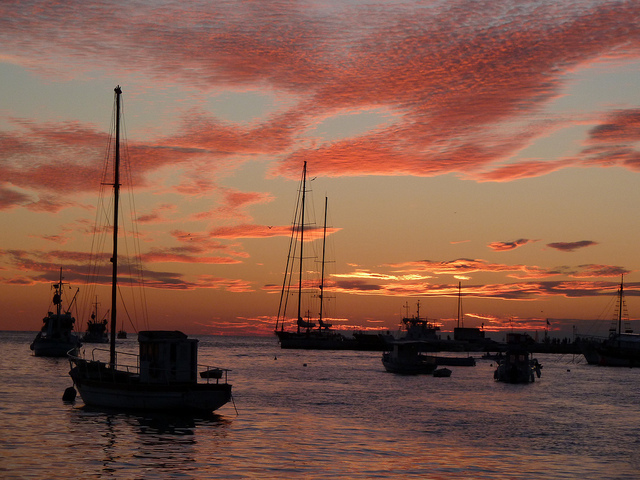 If you’d like to have a luxury holiday accompanied with sports events, you should go to Umag. Umag is a hometown of ATP Croatia Open. It is the oldest and the most popular tennis tournament in Croatia, that takes place every July and is visited by more than 80.000 people. It is a part of ATP World Tour 250 series. This tournament has always been famous, not only because of tennis but for its abundant entertainment and gourmet program. Whatever you choose to see in Istria, we guarantee you that you’ll bring the most beautiful memories home from Croatia. Poreč offers attractions and events for every taste – sports facilities, concerts of classical and jazz music, folklore festivals and street art, museums and galleries, as well as lovely shops and restaurants with local delicacies, amazing landscapes and plenty of entertainment for the children. Its turbulent history and the influence of many different nations and cultures resulted in a multicultural state of mind of the today’s Poreč. So, wherever you go precious cultural heritage can be seen. We recommend you to visit famous mosaics of the sixth-century Euphrasian Basilica – one of the UNESCO World Heritage Sites. At the foot of Tar, nearby village, on the plantation Larun there are olive groves that give you the best olive oil in Europe. Take a trip to a small tourist and fishing village of Funtana that is located south of Poreč. This elevated seaside village began to develop at the beginning of the 17th century when a nobleman Bernardo Borisi built a castle and church on its ground. This is a scenery you wouldn’t want to miss. During your vacation, you should consider going on a trip to Medulin. The weather there is ideal for biking, horse riding or sunbathing on Medulin’s unique sandy beach Bijeca. If you’re seeking for an adventure, visit small islands of the Medulin archipelago – Ceja, Levan and Bodulaš. You’ll find everything you need on this streets and port, in the hotels, campsites, villas and apartments of Plava Laguna or Zelena Laguna. 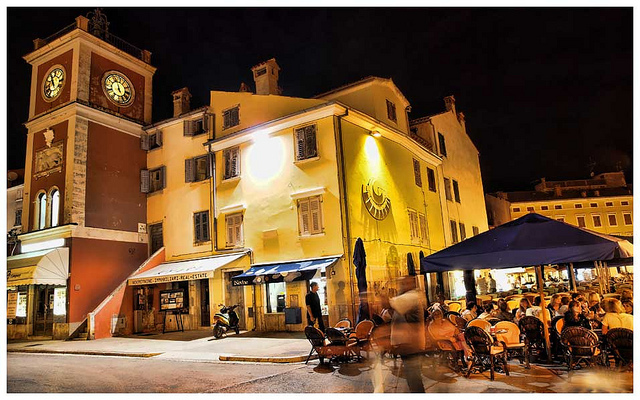 Poreč and its surroundings will always draw the best out of you. So, what are you waiting for, pack up your bags and hit that road! 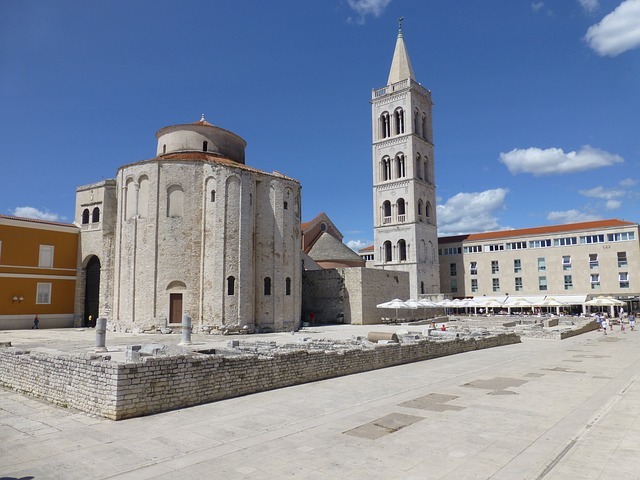 Learn the history while checking out the Zadar walls that were built during the Middle Ages and during the Turks occupation of Venetian Republic. Peek inside the St. Anastasia’s Cathedral (the biggest cathedral in Dalmatia), St. Donatus Church (the symbol of the city of Zadar), St. Chrysogonus Church (the martyr and a patron saint of Zadar) or walk along the remains of the Church of Stomorica (whose foundations were made in 11th century). Climb the Bell Tower next to the St. Anastasia Cathedral and enjoy a perfect view over the Zadar old town within a minute. Visit the island of Galešnjak, a heart-shaped island also known as the Lovers’ Island, whose natural sites will leave you breathless. Island’s shape was recorded for the first time in the 19th century by Napoleon. And most of all try the famous Maraschino, a desert liqueur made from local autochthonous Maraska cherries that are known as the food of Gods.